Plant Materials - Sacred Space Garden Design, Inc. Moderate growing 4 to 5 ft. tall, 6 to 8 ft. wide. 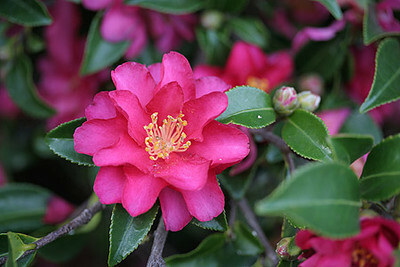 A versatile performer displaying profuse, hot pink, semi-double blooms with golden yellow stamens in the center and glossy, dark green foliage. Flowers are perfect for cutting. Excellent choice for a colorful low hedge, espalier or high profile groundcover. Early to mid season bloomer. Evergreen.